A map of Africa showing Ghana from Atlapedia Online. Click on map for more information. What have been the chief characteristics of educational developments in Ghana since 1945? Why attend school? Can a family (or a government) afford continuing education? Those questions are universal and timeless. Students and societies were asking those questions in the earliest days of civilization, and the same questions are asked today. In the earliest days, skills for living and philosophies of life were passed through generations by seeing, hearing and doing. Formal education has evolved to a more modern classroom, but education oriented toward work and community living continues. In Ghana, generally, skills needed for community life are taught outside the traditional western educational setting. Families share and care for family members in need. Communities closely work together. Whole villages farm common land. Coastal villages work the fishing nets together. Other villages do weaving or woodworking. On a national level, the government of Ghana provides health and welfare services, roadways, utilities and industry, and an educational system, and the skills needed to contribute to this national infrastructure are learned in a formal classroom. Underpinning such an infrastructure is a basic level of common education that allows communication and understanding of common problems and solutions that may be provided. In colonial days, Great Britain established a government infrastructure. Roads and railroads linking villages were built in the 1800s, as well as a harbor. In 1878, cocoa was introduced and became a major foundation for Ghana's economy. Also, large scale gold mining was developed. The development of a western style education system received a major push in 1925 with the Education Policy in British Tropical Africa Act which expanded schools throughout Ghana and led to the founding of the University of Ghana in 1948. The British style of indirect rule through local agents gave Ghanaians experience with modern, representative government. An accelerated transition of Ghana (called the Gold Coast prior to independence) to an independent country began with the United Gold Coast Convention and the Convention People's Party, founded by Kwame Nkrumah in 1949. At the time of independence on March 6, 1957, Ghana had a strong national infrastructure and a sound economy. In 1960, a new constitution was created, and Nkrumah became president. Massive national projects followed, including building the Volta Aluminum Company and the Akosombo Dam and extending free universal education. This rapid expansion and a world drop in the price of cocoa left Ghana heavily in debt by the mid 1960s. Economic problems continue today. With regard to education, in 1951 the Accelerated Development Plan for Education called for six years of free basic education. Also, a major campaign to teach adults to read and write in their own language and in English was initiated. The Education Act of 1960 called for universal education, but economic problems have prevented the accomplishment of this goal. In 1987, pre-university education was reduced from 17 years to 12 years, with six years for primary school, three years for junior secondary school (JSS) and three years for senior secondary school (SSS). Increased emphasis was placed on vocational training in JSS to better equip students not entering SSS to enter the job market. In 1989, the president of Ghana, Flight Lieutenant Jerry Rawlings, emphasized that adult education was directly related to economic development of Ghana. In 1996, a program for nine years of free compulsory and universal basic education (FCUBE Programme) was established by the Ministry of Education. Questions of who can afford continuing education have troubled Ghana. A priority of education for all has taken a large percentage of the nation's budget. In 1972, education received 20 percent of the national budget. In 1999, 35 percent of the budget went to education. In the early 1990s, severe budget problems and pressure from the IMF resulted in increased fees for education. For the 1999-2000 school year, the cost to attend college rose by almost 600 percent. Students boycotted classes and rioted. Universities were closed and then reopened after negotiations between the government and the students resulted in reduced fees. The debate continues over the availability of education for anyone able and interested in passing entrance exams. Will education become available only to the wealthy elite and create new social structures of the rich and the poor in Ghana? 1482. The Portuguese establish a fort at Elmina and create the Guinea Company for trading with the coast, establishing the first "outside" presence in Ghana (Foster, p.39). Early records indicate training of villagers to read and write (Graham, p.1). "Education should be adapted to the mentality, aptitudes, occupations and traditions of the various peoples, conserving as far as possible all sound and healthy elements in the fabric of the social life, adapting them where necessary to changed circumstances and progressive ideas, as an agent of natural growth and evolution. Its aim should be to render the individual more efficient in his or her condition of life, whatever it may be, and to promote the advancement of the community as a whole through the improvement of agriculture, the development of native industries, the improvement of health, the training of the people, in the management of their own affairs, and the inculcation of true ideals of citizenship and service. It must include the raising up of capable, trustworthy, public-spirited leaders of the people, belonging to their own race. Education, thus defined, will narrow the hiatus between the educated class and the rest of the community whether chiefs or peasantry." 1948. 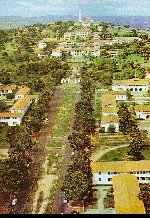 The University College of the Gold Coast (later renamed as the University of Ghana) was established as part of the general development of university education in West Africa for the then British colonies (Graham, p. 176). 1951. The Accelerated Development Plan for Education was initiated, providing six years of free basic education, additional colleges for teacher training, increased salaries for teachers, and increased scholarships to secondary schools. March 6, 1957. The Gold Coast becomes the first country in Africa to gain independence from colonial rule. Kwame Nkrumah is made Prime Minister. 1960. Republic of Ghana is created under a new constitution, and Nkrumah is elected president. Nkrumah had a vision for Ghana to take the lead in forming a union of African independent states. Also, he quickly initiated major social transformation projects including nationalization of foreign-owned businesses; building the Volta Aluminum Company and the Akosombo Dam; building new roads, and expanding health services and schools. The Education Act of 1960 called for universal education. However, by the mid 1960s, Ghana was heavily in debt. Economic problems continue today. 1966. Nkrumah overthrown. A succession of military and civilian governments could not deal with a deteriorating economy. Declining production and world prices of the major export (cocoa), smuggling, and government corruption were major contributors to Ghana's problems. 1983. Jerry Rawlings, leader of the ruling Provisional National Defense Council (PNDC), negotiated loans from the World Bank and the International Monetary Fund (IMF). Under the Economic Recovery Program, mandated by the IMF, national debt was reduced, exports increased, and per capita income increased. In 1995 (Barry, p. xxxvii), Ghana was considered the economic model for Africa by the Western banks. However, many jobs were eliminated and fees were added for health care and education. 1987. Pre-university education is reduced from 17 to 12 years with six years for primary school, three years for junior secondary school (JSS) and three years for senior secondary school (SSS). 1992. A new constitution written; 200-member national parliament elected; Jerry Rawlings elected president under the National Democratic Congress (NDC). 1996. Free Compulsory and Universal Basic Education (FCUBE) Programme began by the Ministry of Education to provide all children of Ghana with nine years of basic education. 1999. My daughter attends the University of Ghana for a semester. Before classes began in September, students rioted over a 600 percent increase in fees and the university was closed. Classes were started for 60 foreign students. In November, the university reopened for all students. Several excellent books are readily available about life and education in Ghana. Ansu-Dyeremeh, Kwasi (1997). Communication, education and development: exploring an African cultural setting. Ghana Universities Press. Antwi, Moses K. (1992). Education, society, and development in Ghana. Unimax. This book provides an excellent history of Ghana and an excellent history of education in Ghana. Barry, LaVerle (1995). Ghana: a country study. Library of Congress. This book provides a short history of Ghana and a good description of the different elements of society in Ghana, including the education system. James Madison University uses this book as a textbook for a summer study in Ghana. The book is readily available in public and university libraries. Also, the full text is available over the internet (http://lcweb2.loc.gov/frd/cs/ghtoc.html) from the Government Printing Office. Foster, Phillip (1968). Education and Social Change in Ghana. Chicago: The University of Chicago Press. This book provides an excellent description of the different roles of education in society and how formal education has evolved in Ghana. Some contrasts are provided with education in other countries that have different forms of government. A major study by Foster of student educational and career aspirations and expectations is summarized in the book. Glewwe, Paul (1999). The economics of school quality investments in developing countries: an empirical study of Ghana. Macmillan; St. Martin's Press. The University of Oxford. Graham, C.K. (1971). The History of Education in Ghana. London: Frank Cass & Co. LTD. This book provides a description of different methods of instruction and curriculum that evolved in Ghana with comparisons to how the same methods were used in Europe. The growth of schools of various types is presented. Osei-Agyemang, Seth (1995). Education and modernization in Ghana: conflict and challenges, 1951 - 1990. Fordham University Ph. D. Thesis. crawfurd.dk/africa/ghana_timeline.htm. This site provides a good summary of Ghana's history, as well as links to many other aspects of Ghana. See also www.ghanaweb.com/GhanaHomePage/history/ or www.historyworld.net/wrldhis/PlainTextHistories.asp?historyid=ad43. www.library.yale.edu/~fboateng/fbhp.htm. This site provide a good summary of Ghana's history, as well as links to many other aspects of Ghana. www.ghanaweb.com/GhanaHomePage/republic/. The Republic of Ghana has an official web site that includes links to the University of Ghana (www.ug.edu.gh/), other colleges, and primary and secondary schools. opokuwareschool.org/site/?q=node/5. The Opoku Ware School has one of the more comprehensive webpages for a Senior Secondary School in Ghana. In 1952, this school was founded as a Roman Catholic Mission College in Ashanti with an enrollment of 70 students. Today, the school has 1277 students in ages between 11 and 18 years. The school includes 8 dormitories, 36 classrooms, 3 science laboratories and many other modern facilities. prempeh.org. The Prempeh College was the first boys' Secondary School to open in Ashanti in 1949 jointly by the Presbyterian and Methodist Churches. Starting with 50 students, the school is home to 1600 students today. www.sas.upenn.edu/African_Studies/Current_Events/ghana_lit.html. The introduction of computers and the internet to schools in Ghana is included in several major new initiatives. This site describes an initiative called SchoolNet. www.usaid.gov/gh/. A short summary of modern educational reform in Ghana is found on this website by the USAID. This page is copyright © 2000, C.T. Evans and R. Sentell.